Dragon Quest VII: Fragments of the Forgotten Past is a game about rebuilding a shattered world. Appropriately, when you play this Nintendo 3DS remake of Square-Enix's 16-year-old RPG, it's clear the gleaming new adventure is built on the bones of an ambitious but deeply flawed relic of the PlayStation era. The original Dragon Quest VII – initially released on these shores as Dragon Warrior VII – is still considered a good RPG, but it swishes far below greatness for a significant reason: The adventure is as bloated as a dead gasbagon fermenting by the side of a river. Though many of us (myself included) missed out on Dragon Warrior VII when it had its first go-round, it's still widely known as the RPG nobody finished because to do so requires at least 100 hours of your life. "Guys, emergency! I gotta pet that dog!" It's not as if the entirety of that time investment goes into exploring cool new areas, either. Instead, you drift through a series of archipelagoes in search of the fragments that are necessary to restore the world to its former glory. In turn, that means stumbling through winding dungeons and going up against endless chains of random encounters. As the words "review in progress" indicate, I'm not yet done with Dragon Quest VII for the 3DS. I can confidently say it won't take me 100 hours to get through its main storyline, though. I can also say, thankfully, that not a single minute of the 50+ hours I've spent with the game thus far feels like a waste. Dragon Quest VII: Fragments of the Forgotten Past is nearly 100% muscle-meat. No fat, no filler, no gristle. Well, almost no filler. The vital story transition from "humble fisherman's son" to "stick-wielding adventurer" takes about 90 minutes. Once you hit the ground, though, it's all hustle and bustle. Like other games in the series, Dragon Quest VII's overarching story is simple good-versus-evil fare. In this instance, a struggle between God and the Devil led to most of existence being wiped away aside from the small island you're born on. When it becomes apparent you're the Destined Hero (that mark on your arm ain't for show, boy), you must find fragments of tablets that let you travel back in time, cure whatever's ailing those ancient continents, and allow them to return to the peaceful sunshine of the present. Catching up on gossip about Smaug, Toothless, et al. Though Dragon Quest VII's story appears oatmeal-flavored from the outset, its appeal is in its individual events, not its bigger picture. Every island you visit and liberate has unique problems. The first realm you free is a standard "Help, monsters are oppressing us" scenario, but things quickly become more interesting. On one island, people have been turned into animals. On another, a poison rain is turning people into stone. On yet another, the monsters are seemingly at bay even though its human denizens have turned on each other. And so on. Dragon Quest VII's story value comes from the people you meet and watching their lives transform as you help them out of their jams. Incidentally, "saving" the world in the past doesn't necessarily spell the end of trouble in the future. There isn't always a tidy solution or a happily ever after, and it's these twists that keep you invested. Simply put, there's an excellent story here that's well-paced (outside of the game's first hour or so, you're rarely expected to sit still while people jaw at you for ages), and it's nice to be able to experience it without burrowing through hours of aimless dungeon-crawling and tablet-hunting. 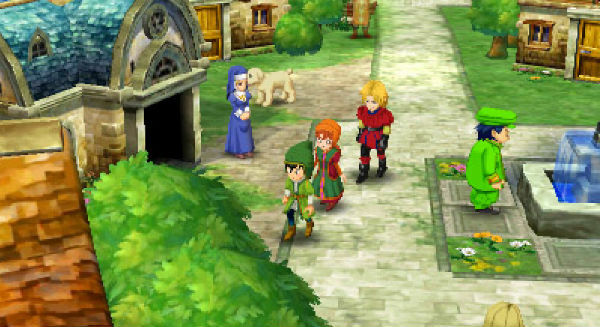 The Dragon Quest VII 3DS remake team actually set out specifically to make a slimmer, trimmer, and more accessible game than the original, and it's a job well done. Gone is the guesswork that infamously sucked the fun out of Dragon Warrior VII. A "tablet tracker" that lights up whenever a piece is in the vicinity makes tablet-hunting painless, as does a hint system that gently points you in the direction of missing pieces if you find yourself befuddled. One of these characters is riding their mother. The tracker and hint system blend well with other new time-saving features, like complete maps of every town and dungeon you enter, and the elimination of random encounters. 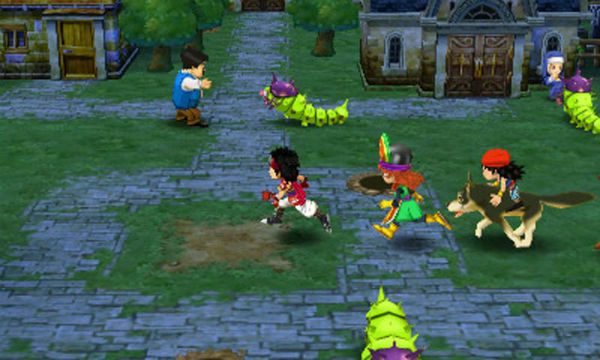 As in Dragon Quest IX, your foes are visible on-screen. They may charge you if you're spotted, but it's usually not hard to give them a wide berth, especially in open areas. And if you're a higher level than they are, they'll ignore you or outright flee. 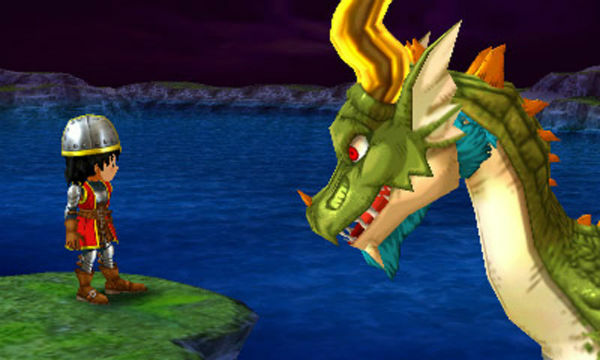 Many of Dragon Quest VII's dungeons are full of twists, turns, and dead ends. It's easy to see how Dragon Warrior VII's lack of decent maps combined with random encounters would make for an agonizing journey. But my very favorite thing about Dragon Quest VII is its accessible and streamlined job system. As is typical of Dragon Quest games, jobs are your primary means of picking up skills and spells. There are dozens of the gosh-darn things in Dragon Quest VII, including several monster-based vocations. It's an intimidating realization until you realize most job-switches don't require you to also juggle your equipment, nor do they penalize you if you're using the "wrong" type of equipment. Ruff the wolf-boy can be a boomerang-wielding Monk if you want him to be, and the game never wags its finger at you. This non-prejudiced job system makes experimentation a breeze. Don't be fooled into thinking the new Dragon Quest VII is underweight, however. Even with all its filler blasted out, it's still an adventure of considerable heft. As I stated earlier, I'm over 50 hours into the game and I'm still not done. I can see the sun peeking over the horizon, but I'm not quite there. And I know the game won't be "over" once I've restored peace. There are still Tiny Medals to hunt, monsters to tame, and traveller's tablets to collect. Traveller's tablets work much like the treasure maps from Dragon Quest IX and are similarly sharable via StreetPass, so if you enjoyed sinking hundreds of hours into Dragon Quest IX's post-game, prepare to keep Dragon Quest VII nestled in your 3DS's cartridge slot for a long time. I'll pile on more observations about Dragon Quest VII: Fragments of the Forgotten Past day-by-day until I finally plunge my sword into the Devil's heart (or the heart of whatever abomination is waiting for me at the end of all this). For now, it's an easy recommendation for RPG fans of all shapes, sizes, and stripes. If this is your first crack at Dragon Quest VII, welcome to the fold. And if you were burned by Dragon Warrior VII in 2000, don't be afraid to downsize. Tagged with jrpg,	Nintendo 3DS,	Reviews,	review-in-progress,	Role Playing Games.